It wasn’t so long ago that a post I wrote on eczema being a mast cell/histamine intolerance related issue went pretty viral. A recent re-post on my Facebook page generated an impressive number of requests for me to look into whether rosacea is also one. Well, guess what folks – it sure is! Sadly it seems that word isn’t spreading as fast as we might like, at least not fast enough to the doctors who might help us. So here’s all the research you’ll need to take to your dermatologist in order to make him aware of the link, or get your family doctor to write you that mast cell specialist/immunologist referral you may have already suspected you need. Wikipedia calls rosacea a chronic inflammatory “skin disease” characterised by facial redness, small and superficial dilated blood vessels, papules, pustules and swelling. Celebrities dealing with it include former US president Bill Clinton, Mariah Carey, burlesque star Dita Von Teese, actress Diane Kruger  and according to some online sources/websites, Cameron Diaz and Prince William , something I haven’t independently verified. A study in the Journal of Investigative Dermatology, funded by a research grant from the National Rosacea Society, revealed that mast cell numbers are increased in the skin of rosacea patients . The study found that the mast cell proteases recruit other immune cells, thereby amplifying the inflammatory response. Demodex skin mites have also been shown to play a role in rosacea , by triggering the inflammatory response or blocking hair follicles. And that’s a great point I should elaborate on. The presence of these mites could be the actual mast cell trigger. 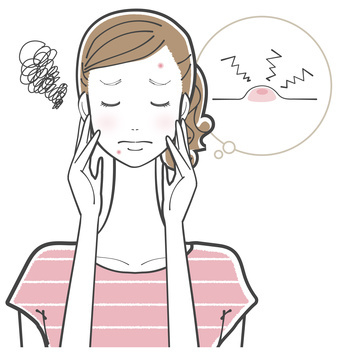 Having rosacea therefore doesn’t necessarily mean that you have an actual mast cell disorder. This is something I had to wrap my head around just last year. That some of us with histamine/mast cell symptoms, are experiencing them as a result of a primary issue, like mites on our skin, a bacterial or viral infection, rather than us having an actual mast cell disorder that is causing the rosacea symptoms. How to tell the difference? Dr. Diana Driscoll has spoken about this quite a bit . Seems many of us are still pretty much in the dark as to which came first – the mast cell disorder or mast cell disorder symptoms caused by a virus or something. In my case, I believe that my mast cell activation, the symptoms of which have disappeared of late, was secondary to a stress disorder. As Joseph Cohen over at Self Hacked told me during a genetic consultation I did with him: “You’re wired for stress!”. I’ll go into more detail about this in an upcoming post. I have to, because I continue to be shocked by how my symptoms evaporated as I dealt with my lifelong, debilitating stress. The list of common rosacea triggers featured on the National Rosacea Society’s website looks suspiciously familiar, with patients self reporting spinach, avocado, yeast, vinegar, alcohol, eggplant, tomatoes, citrus fruits, spicy foods and “foods high in histamine” as problematic . As well as beauty products and stress/anxiety. Given that this all does look and sound very familiar…here are some possible tips on dealing with rosacea, from a histamine intolerance/mast cell perspective, and that of someone who struggled with decades of the most hideous skin “acne” that didn’t respond to any antibiotics prescribed, retin A or accutane, or topical creams that thinned out and almost killed my skin, but cleared up 100% after six months on a low histamine diet. I wonder now if it was mild rosacea? Given the incredible similarity between histamine intolerance/mast cell activation and rosacea triggers, and the fact that we are now told there’s definitely a rosacea/mast cell link, what I have been doing to heal my own mast cell disorder/histamine intolerance could apply. As always though, please check with your healthcare provider before making any changes as I am neither a doctor nor a nutritionist. All I am doing is sharing research and what has worked for me. Please remember, what works for me might not for you. Several rosacea societies share that patients self-report stress as being a mega-trigger. This makes sense given the acknowledged role of stress as a mast cell trigger . Meditation and yoga have both been shown to switch off/dampen genes related to mast cell/histamine disorders, as well as inflammation generally . I gave up kickboxing a few weeks ago to focus on yoga. I now practice between five and nine hours weekly, in addition to walking. One of the greatest moments of recent years has been finally achieving a headstand, on my own, without needing a wall to lean my feet onto. I know, it’s the small things sometimes!! There are numerous rosacea treatments that your dermatologist will be aware of, but I found an online patent application from a team at the University of California that really piqued my interest. Their proposed treatment patent outlines a role for mast cell stabilisers and vitamin D . Many people begin conversations with me thus: “I know you’re totally anti-medication” or “I know you don’t believe in taking medication.” Neither of these statements is correct. I do not advise people to come off meds and I do not believe that taking meds is a bad thing. I choose not to take them myself any longer, mostly because I have been overmedicated since birth. I have been on some kind of medication, or many types, every month of my life, till just a few years ago. It’s a personal choice, but you better believe me, if I needed meds, I would take them. Never feel guilty for doing so, never allow anyone to make you feel bad for being so “weak” as to need them. There’s no weakness in accepting help, be it from a doctor or a medicine. Get well, be strong, then you’re in a position to decide if you want to continue taking them. I often ask people why they would stop something that’s making them feel better? In my case, the point is, I was on the wrong meds and wasn’t getting better. Given that mast cell stabilisers may be of use for rosacea, bioflavonoids like quercetin and luteolin, shown to be as effective as the commonly prescribed mast cell stabiliser sodium cromolyn , could be useful. I take Dr. Theoharides’ Neuroprotek (I do not benefit financially in any from mentioning this supplement but he is a friend!). You can of course also find bioflavonoids in most brightly coloured plant foods, the kind that make up the bulk of my diet (check out my Anti-Detox book for some great all liquid recipes). Usually a good bet for those with immune system conditions, including rosacea it seems. Another study funded by the NRS focused on the role of vitamin D enhancing the production of human antimicrobial peptides cathelicidins (LL-37). These beneficial peptides, which normally help prevent inflammation, are “abnormally processed” in rosacea folks . Given that the bioflavonoids quercetin and luteolin are found in plant foods, why not eat the plants, whether or not you’re taking supplements or medication? That’s the question I asked myself just a few years ago. In my case I decided that nothing goes in my mouth unless it treats me. I’m human of course, but when you set yourself a goal like that, even “cheating” by spending 10% of your histamine allowance on still healthy foods (raw cacao, dates, almond flour coconut sugar homemade cookies), you’re still golden! It might surprise you to learn that many common beauty ingredients are mast cell/histamine triggers. They’re too numerous to mention here, but I’ve found that almost all commercially available brands have these ingredients, as well as those that disrupt the endocrine system (more on that on the EWG website). The great news is that newer, truly natural brands like 100% Pure and RMS Beauty offer very stylish alternatives. To sum it up – if you can buy it at a generic store, it’s likely to cause problems. The aforementioned brands contain more natural ingredients, some of which actually possess antihistamine and anti-inflammatory ingredients like (real) moringa and coconut oil. You’ll find a full list of healing cosmetic products in the low histamine beauty book.